We all know by now that drinking too much during exercise can have fatal consequences, because your sodium levels get dangerously diluted (hence the name of the condition: hyponatremia, meaning too little sodium). So it seems logical to think that drinking beverages containing sodium, rather than plain water, would mitigate this risk. That’s certainly what sports-drink makers want you to think. It is instructive to review the industrial connections of those who wrote the 2007 ACSM Position Stand [Noakes writes]. Of the six authors, four – Drs. Maughan, Burke, Eichner and Stachenfeld – have direct and longstanding involvement with Gatorade and the Gatorade Sports Science Institute (GSSI), but only three (Drs Maughan, Eichner and Stachenfeld) deemed it necessary to disclose in the Position Stand the existence of that relationship. The two remaining authors – Drs. Sawka and Montain – are employed by the United States Army Research Institute for Environmental Medicine (USARIEM)… It is perhaps surprising that given the large number of experts available to it, the ACSM should consistently choose the authors of its influential Position Stands from such a narrow selection of group thinkers. So, Baker concludes in this study funded by the Gatorade Sports Science Institute, endurance athletes should consume sports drinks containing electrolytes. Personally, I don’t think the case is as clear-cut as Noakes suggests. After all, there are some differences between the drinks, as you can see in the graph above. But I also think he’s right to question why a study that failed to find statistically significant differences between drinks with different sodium levels would conclude that athletes should consume drinks with sodium. Maybe it’s true, maybe it isn’t — but the conclusions should follow from the data. Industry might fund good research from reputable researchers, but it will always be interpreted cautiously at best. Lesson learnt from the tobacco industry: s/he who pays the piper calls the tunes. I was always led to believe that GSSI did (and funded) some good research. Gatorade lost me when they were bought by PepsiCo and started marketing to children. Jen: Agreed that there does appear to be some effect of the sodium in the drink (as we’d expect — the sodium doesn’t just disappear once it enters the body!). The question is what’s clinically (or athletically) significant, and it seems pretty clear that not overdrinking is a much more powerful mediator of sodium levels than how much sodium is in your drink. Steve: I should emphasize as strongly as possible that (a) industry DOES fund lots of good research from reputable researchers, and (b) GSSI in particular has funded tons of good research by excellent, honest researchers. In fact, one of the top items on my wish-list is that MORE companies would do the same and fund arms-length peer-reviewed research to back up the claims they make about their products. But as you point out, the results of such research have to be interpreted cautiously. To me, this debate looks more like a question of interpretation rather than one of simple right and wrong. 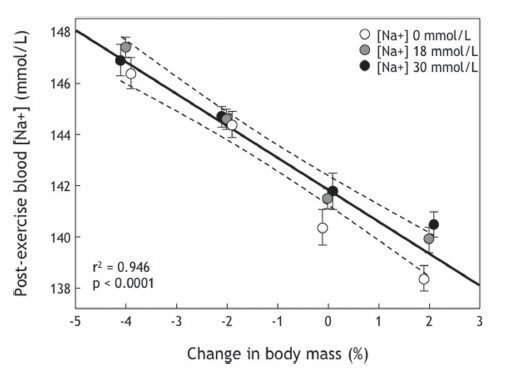 If it turns out that body mass change predicts 95% of the variance in sodium levels, while the sodium in your drink explains 5%, then strictly speaking it’s correct to say that ingesting more sodium will lower your risk of hyponatremia. But is that the most logical advice to give athletes? This is where subtle, subconscious preconceptions and biases can play a big role in how we interpret data. I don’t think it’s something that we’ll ever be able to eliminate entirely. After all, even researchers who aren’t industry-funded have their own sets of unconscious biases — for instance, the desire to interpret results in a way that vindicates the theory on which they’ve staked their scientific career. That’s pretty clearly the case here. Ultimately, though, we have to hope that good data, properly presented and interpreted, will help us decide who’s right. What am I missing here? The Y-axis labels on that graph run from 138-148mmol/L. The ingested solution with the highest sodium concentration had 30mmol/L. Admittedly, it would be pretty interesting if you could raise your sodium concentration by ingesting fluids of far lower concentration, but it shouldn’t come as a huge surprise that you can’t. It’s not like this is new ground from a clinical standpoint: victims of hyponatremia are treated with solutions of much, much higher concentration. The are in fluid form to facilitate the administration of sodium, not water. Just the opposite is true of Gatorade: my recollection is that the concentrations of sugar and sodium in Gatorade were chosen to maximize absorption of water from the GI. The sodium is not there to replace your sodium any more than the sugar is there to replace your sugar; the purpose of both is to replace your water. It follows that repositioning Gatorade as a sodium replacement drink was always going to be purely a marketing exercise. Good points as always, Phil. When you look at it like that, the conclusion does seem fairly obvious. That being said, even if you can’t RAISE your sodium concentration by ingesting fluids of a lower concentration, it is theoretically possible that you could reduce the decline in your sodium concentration by drinking fluids that contain some sodium rather than none. This effect will inevitably be small — the question is whether it’s clinically significant. When Noakes sent a reply to JAP disputing the conclusions, including the graph I included in my post above, it was rejected (which is why he published it instead in the less widely circulated BJSM). In his BJSM paper, Noakes makes a big deal of the factor that Gatorade and the GSSI were for many years the sole platinum sponsors of the American College of Sports Medicine, which issues influential position statements and publishes Medicine & Science in Sports & Exercise. The publisher of JAP, he points out, also receives some token Gatorade support. And many of the peer reviewers who decide whether to accept or reject research on hydration benefit from industry support for their own research. Oh dear – it seems I misread you. I didn’t realize that the only point of dispute was whether very small differences are or are not statistically significant. I apologize. I have to say that this question is not so interesting to me personally, because if one is some small distance epsilon from the threshold of significance – usually 95% – it doesn’t seem that important which side of the line one is on, because the threshold itself is so arbitrary. And even now that I understand the issue, I am not quite convinced. If we estimate the ordinary percentage of body mass that is water to be fairly high, say 70%, and the total amount of fluid ingested to be fairly small, say 3%, then to first order in terms of weighted averages we are comparing numbers like (0.67 x Na +142 + 0.03 x Na+30) versus (0.67 x Na+142 + 0.03 x Na+0). There isn’t much in it. Finally, regarding the absorption and use of exogenous carbohydrate: you are preaching to the choir! In fact, you may regard me as sugar evangelist, if you wish. My point was that – in my recollection – that is not the *reason* that Gatorade contains sugar. And in fact, standard Gatorade does not have a whole lot of sugar; I would never rely just on Gatorade for sugar replacement. Phil: No, you didn’t misread me! There are many points of dispute up for grabs in this post… 🙂 You and I may agree that the only argument is whether these small differences cross the threshold of significance, but meanwhile the peer-reviewed literature tells us that athletes need sodium in their drinks to avoid hyponatremia. And finally, on the unrelated point of sugar: one 8oz/240ml bottle of original Gatorade has 56 grams of sugar in it, which is roughly equivalent to the maximum amount you can usefully absorb in one hour (unless you’re using multiple transportable carbs a la Jeukendrup, in which case you can bump that rate up to about 90 g/hr). I’m not saying there aren’t better ways of getting your sugar — but when Gatorade makes the marketing claim that its sugar helps fuel you during extended exercise (and they do say that), it’s a claim that I’m willing to accept as backed by science, unlike the sodium/hyponatremia claim. “In early summer of 1965, a University of Florida assistant coach sat down with a team of university physicians and asked them to determine why so many of his players were being affected by heat and heat related illnesses. The researchers — Dr. Robert Cade, Dr. Dana Shires, Dr. H. James Free and Dr. Alejandro de Quesada — soon discovered two key factors that were causing the Gator players to ‘wilt’: the fluids and electrolytes the players lost through sweat were not being replaced, and the large amounts of carbohydrates the players’ bodies used for energy were not being replenished. Of course, this may be revisionist history in light of more recent science. But I’d always understood that the carbs were a key Gatorade selling point. Gatorade Perform 02 (original Gatorade) is about 6% CHO so we’d expect 14g/240ml of sugar which supply ~ 56 kc/8 oz. Ugh, my bad on the math! Yes, 14 grams — so you’d need to drink four 8oz servings (i.e. about a litre) per hour to max out your carbohydrate absorption. But like a moth to the flame, I can’t resist being drawn back to the main point. I understand and agree with the outrage about lying in a peer-reviewed publication. But in my view it would be little less heinous to present as important effects that are immaterial but statistically significant. There is the obvious “who cares” aspect of immaterial effects. But beyond that, an experiment that finds small effects is inherently less robust than one that finds large effects. One reason is that the smaller the effect measured, the more subtle and therefore more likely may be an overlooked confounding factor that ruins the experiment. Another is that latent sources of uncertainty, such as measurement errors or the possibility of a misapplied or miscalculated statistical model become relatively more important. I think that this is a big deal about nothing. The results werent significant because there wasnt enough sodium in their drinks (only 30 mmol/l whereas their sweat averaged 56 mmol/l) and they didnt sweat very much (2.6-2.7 liters). Have you ever tried drinking sweat? There’s a reason Gatorade doesn’t have that much salt: you wouldn’t be able to handle it. You would if you were sweating it out. No, but seriously: do you really drink 56 mmol/l fluid when you exercise? Not in theory, but in practice. This is a theoretical for blood osmolarity. I normalized the data a bit and added a line for sweat. Hope you like it.